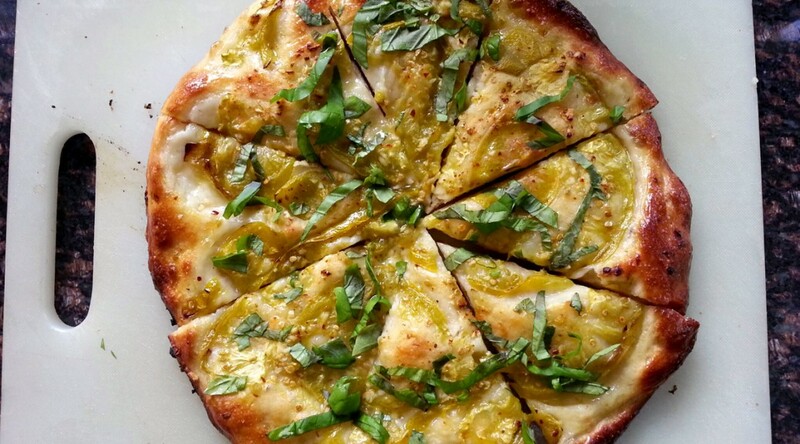 It seems lately we’ve been craving pizza and focaccia and bread daily. In the summer months, when the markets offer so many juicy, perfect tomatoes, I find myself making tomato-topped focaccia more often than not (my other great weakness is herbed focaccia, especially rosemary). Here is last week’s very summery focaccia. We ate it with an array of fresh and aged cheeses; roasted beets with walnuts and tarragon; steamed string beans splashed with olive oil, garlic, and parsley; and a refreshing green salad with lemon and olive oil. What more can you ask for? Oh, and we had amazing nectarines and fresh figs for dessert. We’re going to miss summer!! Remember to allow 24 hours for the dough to rise in the refrigerator for best flavor. Make the topping: When you are ready to bake, thinly slice the tomato. Arrange decoratively on the focaccia dough, possibly without overlapping (be sure to use any of the delicious juices from the tomato; just pour any juices from the cutting board onto the dough). Season with the salt. In a bowl, mix the olive oil, garlic, and chili. Brush 1 tablespoon of the mixture over the focaccia dough, but try to use all the garlic at this point (ideally, you will have just olive oil left; raw garlic can be a bit jarring on the focaccia after baking). Place the pizza pan on the hot baking stone and bake 20 minutes, or until golden brown. 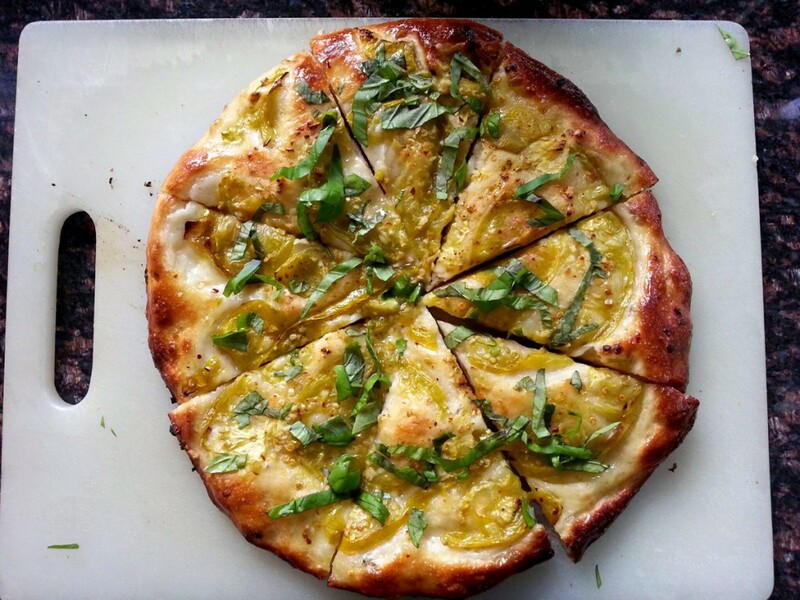 Using a plant mister, spray the focaccia three times with water during the first 10 minutes of baking. Be sure to close the oven door quickly each time or else the oven temperature will drop. Remove from the oven, and brush with the remaining tablespoon of olive oil. Sprinkle with the basil. Cut into wedges and enjoy hot. I love okra. I grew up eating it slow-cooked with tomatoes, onions, lemon juice, and a pinch of sugar, the way my Turkish Nonna Eva made it. When braised, okra comes out somewhat slippery, and my husband (one of the many people who object to okra’s potentially mucilaginous texture) doesn’t like it prepared this way. 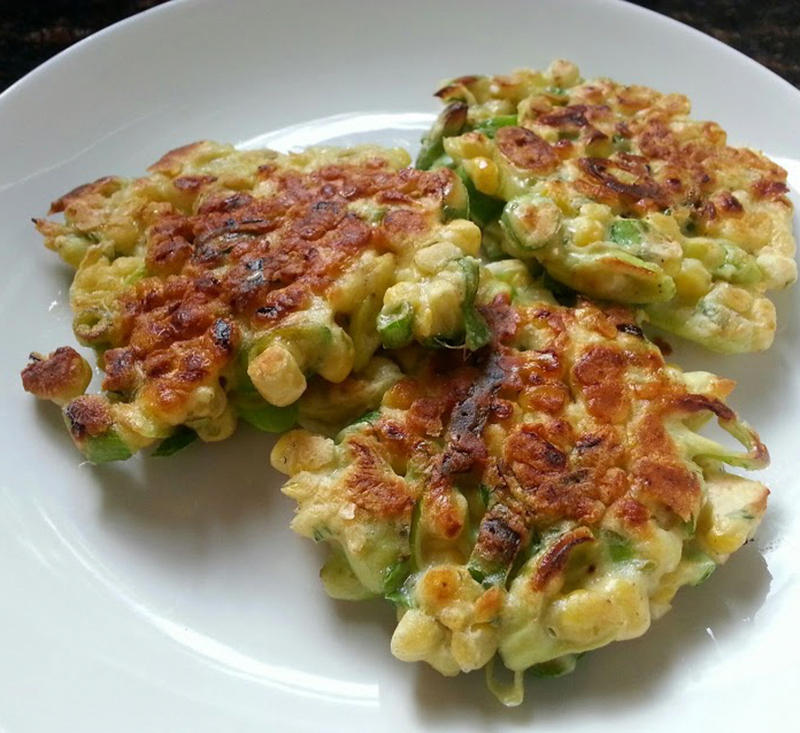 So at home, when I crave okra, I serve it pan-seared or roasted. Roasted okra, while delicious, has a tendency to dry out if left in the oven just a few minutes too long. 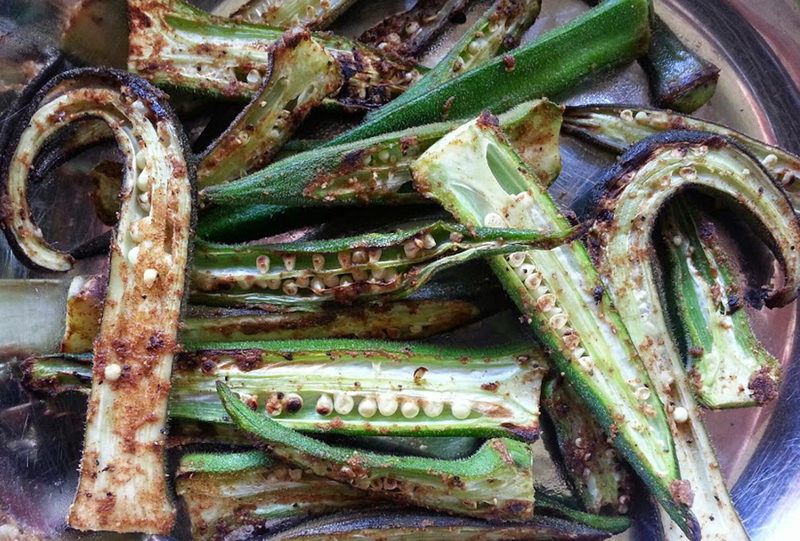 Pan-searing is far faster and yields delectably crisp-on-the-outside, soft-within okra. 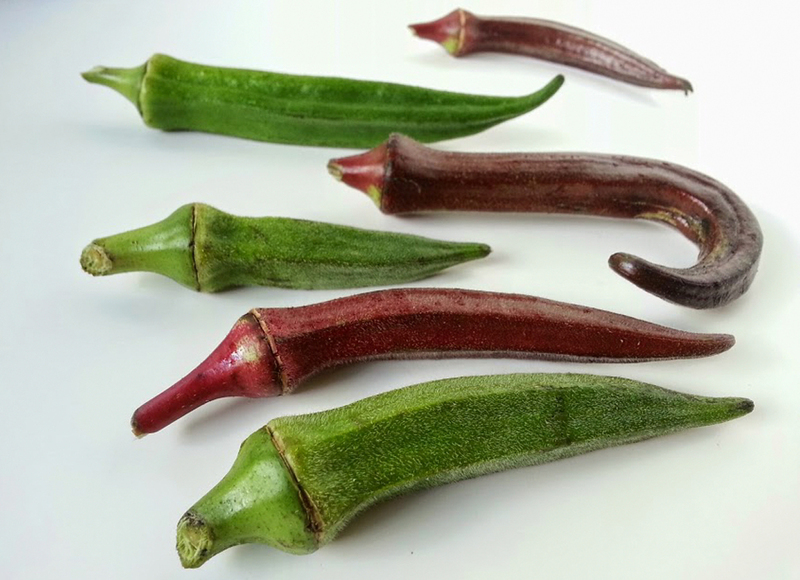 Look for okra that is firm, unblemished, and heavy for its size. Rinse thoroughly, then cut off the pointed end at the top. 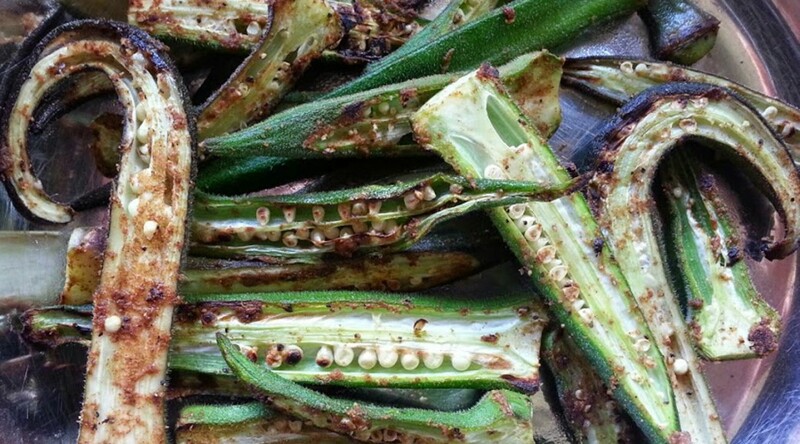 Cut in half lengthwise, and lay on paper towels with the cut side facing down; the drier the okra is before cooking, the more easily it will brown in the pan. Serve this spicy okra with a cooling yogurt sauce for dipping. Make the dip: Combine all the ingredients in a small bowl and taste for seasoning; adjust as needed, then refrigerate for 30 minutes to 24 hours. Make the okra: Place the okra on a double layer of absorbent paper towels, cut side down, and let rest at room temperature 30 minutes to drain off excess water. Place in a large bowl and add the olive oil, salt, cayenne, and black pepper. Toss well to coat evenly with the spices. Place the okra, cut side down, in a 12-inch nonstick skillet. It should all fit in a single layer, but if it does not, then cook it in 2 batches to avoid stacking the okra. Set the skillet over medium heat and cook, undisturbed, until browned on the bottom, about 4 minutes. Turn and cook until the other side is also browned, about 3 more minutes. Adjust the seasoning if needed and serve hot or at room temperature, with the dip. 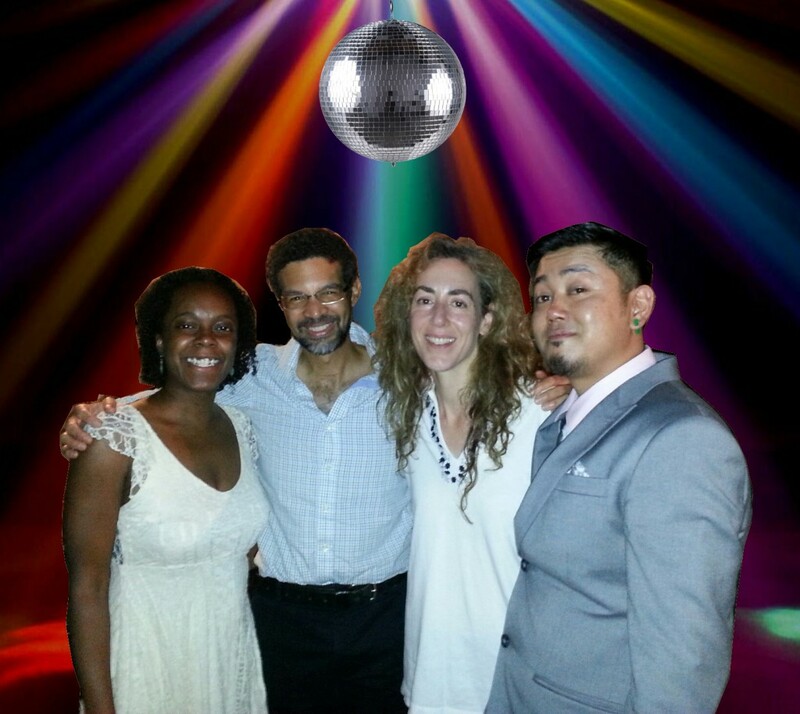 A few days ago we were invited to our chef Elizabeth’s wedding celebration. Everyone brought a favorite food from home, and one of the dishes we most enjoyed was made by Jessie, a chef who has worked with us for many years. It was colorful, unusual, and delicious. This is our somewhat pared down version of hers: I have omitted the green apples, tomatoes, and a number of hard-to-find ingredients (culantro and aji dulce among them). The result is visually striking, vibrant in flavor, and very addictive thanks to the pop of the toasted sunflower and pumpkin seeds. If you like cilantro and happen to have a bunch with stems attached, chop the stems (not the leaves) and add them to the onion and garlic base when sautéing. The salad keeps well for days in the refrigerator but needs to come to room temperature before serving for best flavor. The list looks daunting, but it is actually very easy to put together, as most of the work is hands-off. Be mindful of the fact that different brands of Israeli couscous absorb different amounts of liquid; the varieties imported from the Middle-East require almost double the amount of water to cook through, so adjust as needed. Make the beets: Preheat the oven to 350 degrees (preferably set on convection). Toss the beets with the olive oil and salt and wrap in aluminum foil. 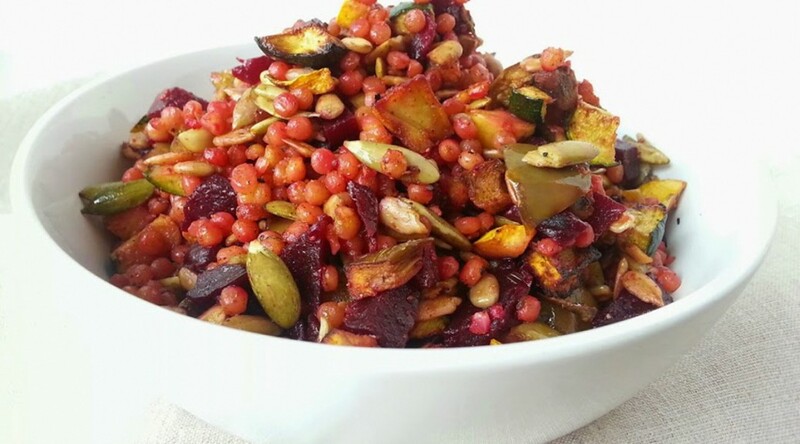 Place on a baking sheet and roast in the preheated oven until tender when pierced with a knife, about 1 hour for small beets and 2 hours for large beets. Unwrap, cool 5 minutes, then rub between paper towels to dislodge the skin. When the beets are cool enough to handle, cut into 1/2-inch dice and set aside in a large bowl. Make the vegetables: Toss all the ingredients on a large baking sheet lined with parchment paper and roast in the preheated oven until browned lightly and tender, about 30 minutes. 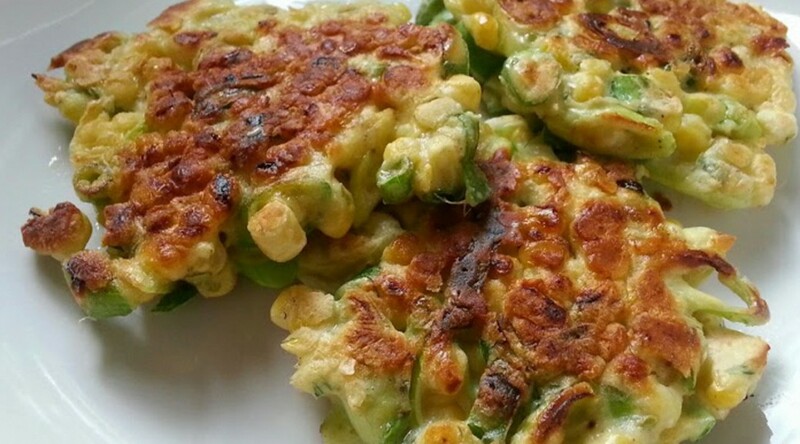 Be careful not to overcook the vegetables; they should still have some life to them. Add to the beets in the large bowl. Make the couscous: Place the olive oil, onion, and garlic in a small saucepan with a tight-fitting lid. Sauté for 2 minutes over medium heat, or until aromatic. Add the couscous and sauté for 3 minutes, or until the couscous is lightly golden; this step intensifies the flavor of the couscous by lightly toasting it. Add the salt and pepper, and slowly pour in the boiling water (it may splutter, so stand back). Cover with the lid and cook over low heat for 12 minutes, or until the water is absorbed and the couscous is tender. If the couscous has absorbed all the water but is still chewy, add more water as needed to finish cooking the couscous (different brands absorb different amounts of liquid, so do check for doneness and adjust as needed). Add to the vegetables in the bowl. 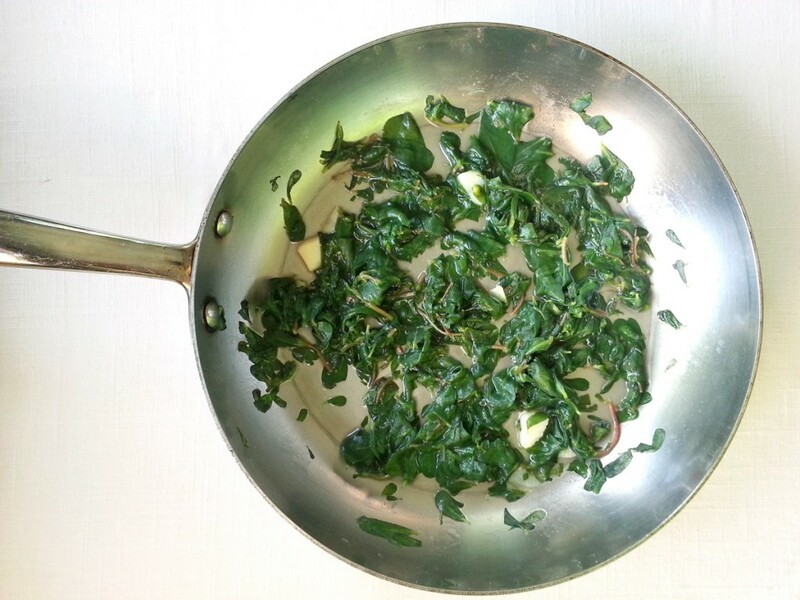 Make the seeds: In a clean skillet, warm the olive oil over medium heat. Add the pumpkin and sunflower seeds, and cook 2 minutes, stirring often, or until golden and nutty-smelling. Watch that the seeds do not burn or they will taste bitter. Add to the couscous and vegetables in the bowl. To serve: Cool the salad to room temperature, about 30 minutes to 1 hour. Stir in the olive oil, adjust the salt and pepper, and serve at room temperature. Congratulations Elizabeth and Eijiro !!! If the file player above is not supported in your browser, you can access the direct link to the song here. This is the sort of bread you crave when you need comfort. 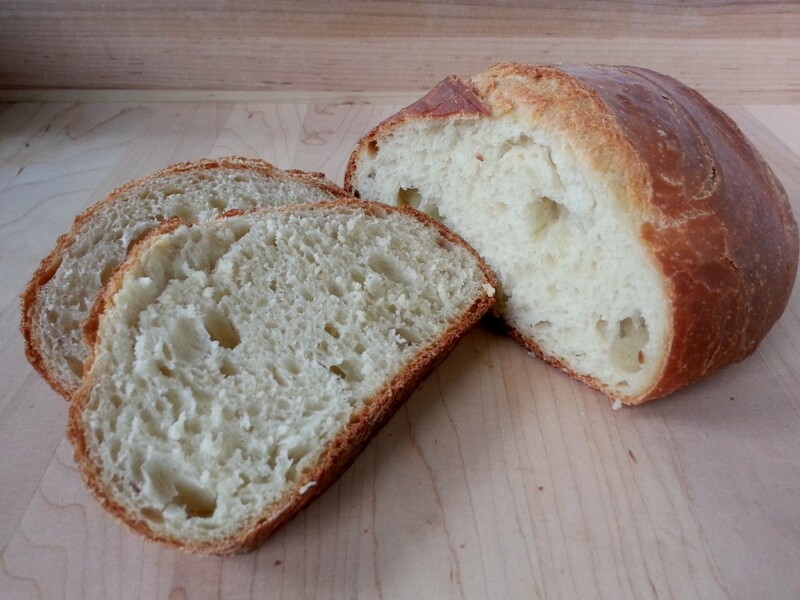 Not too airy, and certainly not dense, it has a moist crumb, pleasantly sweet taste of wheat, and a thin, crackling crust. The addition of a bit of sugar and milk yields a browner, sweeter crust; the olive oil results in a moister, cakier crumb. 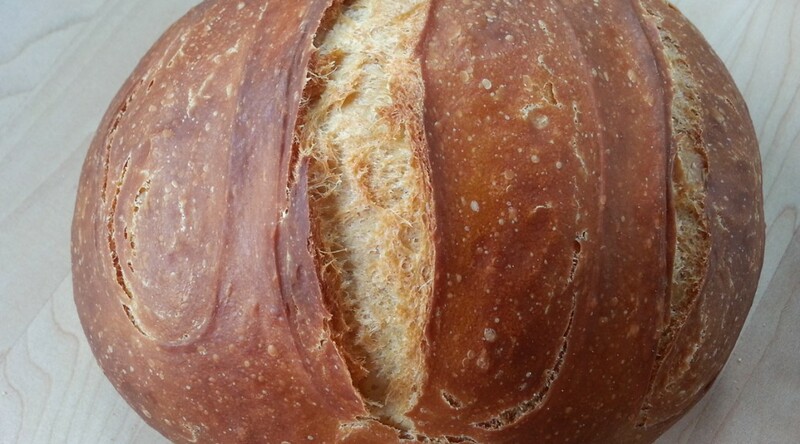 I prefer the bread baked from dough that has had a chance to mellow overnight in the refrigerator: its flavor is more complex, its air bubbles somewhat larger. 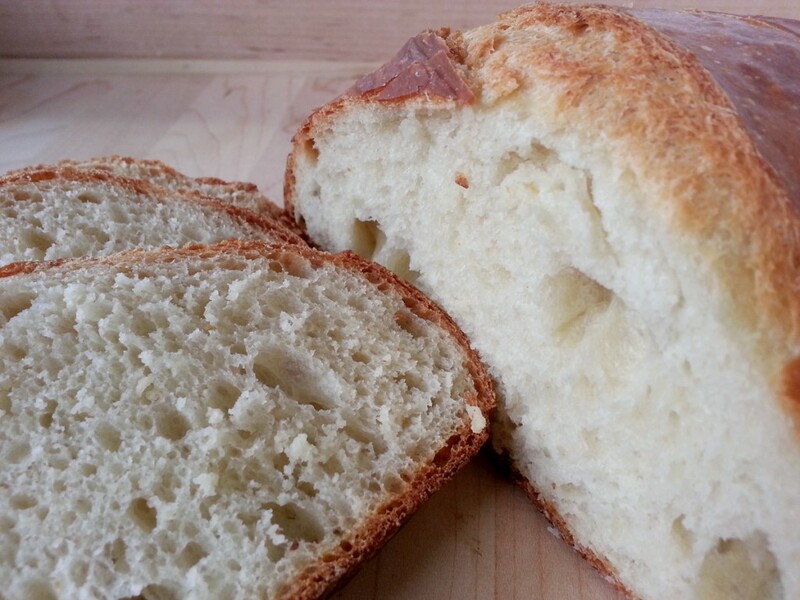 Here I baked the bread as a boule (or large sphere); but the same dough can be baked flat with olive oil and sea salt, for focaccia; or flattened into a slipper shape for a decidedly unrustic take on ciabatta; or rolled thin into baguette…. depending on the shape you choose, the bread will take different amounts of time to bake through, as a taller dough takes longer than a flatter one. But to have a bread with a properly chewy crust, you need to bake the loaf at least until it sounds hollow when thumped from the bottom. Place the flour, yeast, sugar, and 1 and 1/2 teaspoons of the salt in a large bowl. Mix well with a wooden spoon. Add 1/4 cup of the milk and all of the water, and stir well. Add the olive oil and stir again. 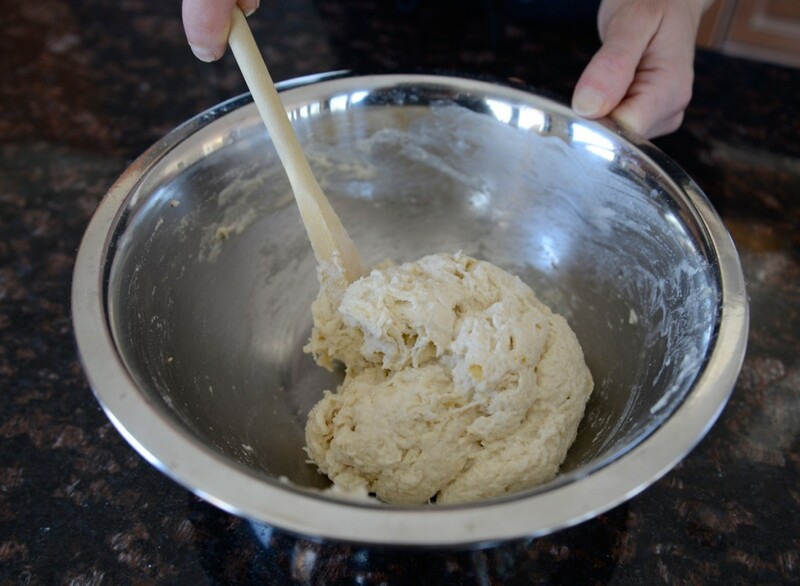 If the dough is too dry to gather around the spoon, add a bit more water by the teaspoon until the dough gathers into a soft mass around the spoon. If the dough is sticky, add a bit of flour by the teaspoon until it forms a cohesive, soft mass. Turn the dough out onto a lightly floured counter and knead vigorously for 10 minutes, or until it is very smooth and elastic. Try to add as little flour as possible to the dough as you knead it; the more flour you add, the denser the bread will be. It is all right if the dough sticks to your hands a little; knead it faster and it will tend to stick less. The dough is kneaded sufficiently when it is smooth and even in texture all the way through, and when it springs back when poked with a finger; it will also stretch about 6 inches without tearing when pulled apart with two hands. Lightly oil a large bowl and place the dough in it. Turn it to coat with the oil and cover with plastic wrap. Let rise at room temperature for 1 hour, or until starting to increase in volume. Refrigerate 12 to 24 hours (a 24 hours rise yields a tastier dough). Return to room temperature when you are ready to shape the dough and bake the bread. One hour before you are ready to bake the bread, and after it has returned to room temperature, preheat the oven with a baking stone on the bottom rack to 425 degrees (preferably set on convection bake). Remove the two other racks so that you have room to slide the two loaves onto the hot baking stone later. Turn the risen dough out onto a very lightly floured counter and cut it into 2 even pieces. Shape each into a round, taut ball. I do this by cupping the dough between my two hands and rotating it a little at a time while putting pressure on the bottom and squeezing my hands together on the very base of the dough. Place 1 piece of parchment paper on an upturned baking sheet (in other words, the baking sheets will have the rims facing down to facilitate sliding the loaves into the oven) and dust each piece of parchment paper with cornmeal. Place one shaped dough ball on each cornmeal-dusted parchment paper and cover with plastic wrap. Let rest 1 hour, or until doubled in size. Uncover, slash each loaf diagonally with a sharp knife three times to score the top (this allows the crust to expand without tearing and looks nice), and brush with the remaining tablespoon of milk. Sprinkle with the remaining 1/8 teaspoon of salt. Quickly slide the loaves into the oven and onto the hot baking stone, one at a time, using the upturned baking sheets as paddles. Close the oven door very quickly. 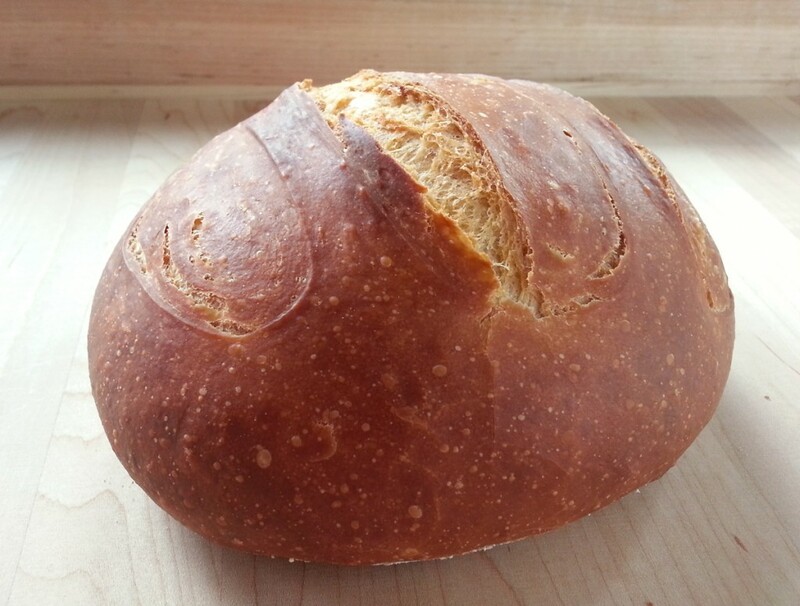 Using a plant mister, spray the loaves three times with water during the first 10 minutes of baking. Be sure to close the oven door quickly each time or else the oven temperature will drop. Bake a total of 30 minutes, or until the loaves are a deep, golden color flecked with brown, and sound hollow when thumped on the bottom. Cool on racks and serve at room temperature. The loaves can be frozen, well wrapped in plastic and placed in freezer-safe bags, for up to 2 weeks, then thawed and reheated in a preheated 350 degree oven for 10 minutes. 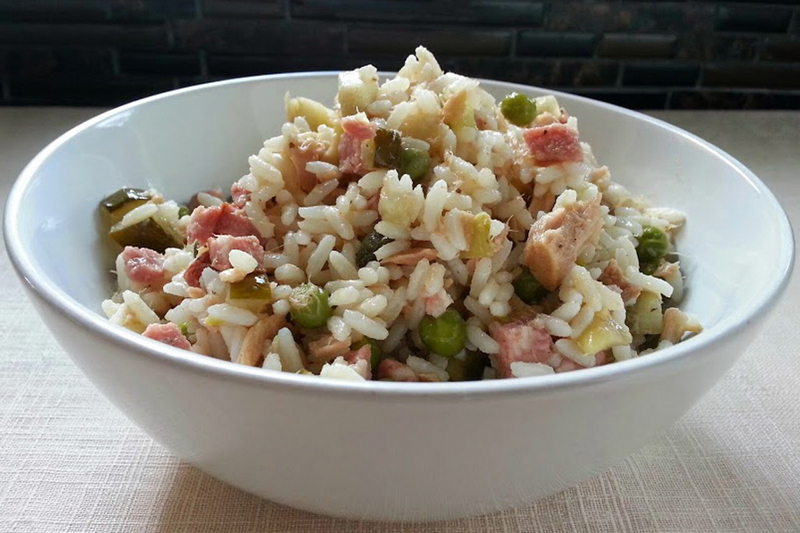 My mom always made this colorful rice salad when entertaining guests in the summer, and for family meals when it got too hot to cook. 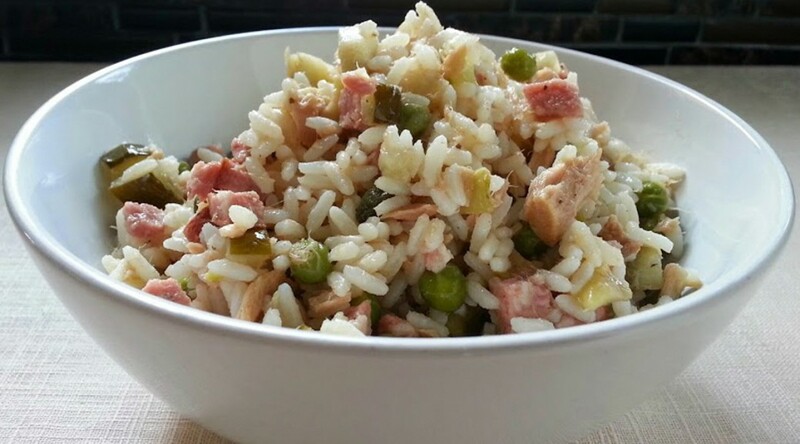 It is the traditional northern Italian rice salad served by families all across Lombardy and Piedmont, with a few personal twists added (Kosher pickles for extra acidity, and Kielbasa instead of frankfurters for deeper flavor). While the ingredient list looks long, the preparation time is minimal. Leftovers are wonderful for days, as long as you return the salad to room temperature before serving, or else the rice will be dry and chewy. That said, I prefer serving the salad before it has seen the inside of the refrigerator: the texture of the rice and the brightness of the flavors will be far superior. To make a vegetarian version, omit the Kielbasa and tuna, and add 1/4 pound of cubed Fontina from Val d’Aosta. And if you would like a jolt of bold color and extra sweetness, add some diced roasted red pepper strips. Bring 2 quarts of water to a boil. Add the rice and cook until almost al dente, about 11 minutes. Add the peas and Kielbasa, and cook 3 more minutes, or until the rice is al dente. The rice should not be mushy. Drain the rice thoroughly and place in a large bowl. Add the artichoke hearts, tuna, capers, and pickles. Stir well. Taste for seasoning and add more vinegar and/or salt if the flavors seem flat. 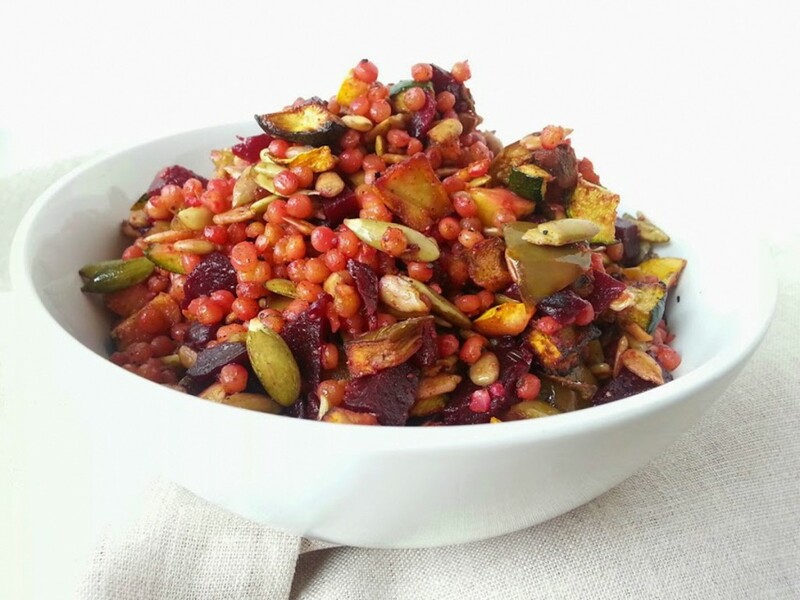 Serve at room temperature, within 2 hours, or refrigerate up to 4 days. We shop at Farms View in Wayne, NJ, a farm close to our home, from spring through fall. We always find amazing produce, and this week, we happened upon purslane. The leaves looked succulent and juicy; the stems were a bright rose. I grabbed a bunch and for lunch today, we cooked some of the tender leaves with just a bit of garlic and olive oil. They were sweet, a cross between spinach and cucumber in flavor, which may sound odd, but is really quite delicious. Had I known the purslane would wilt down so much, I would have cooked the entire bunch. You’ll need about 1 pound to serve two people a healthy side dish, because by the time you strip the leaves off the stems and account for shrinkage in the pan, you will have very little. 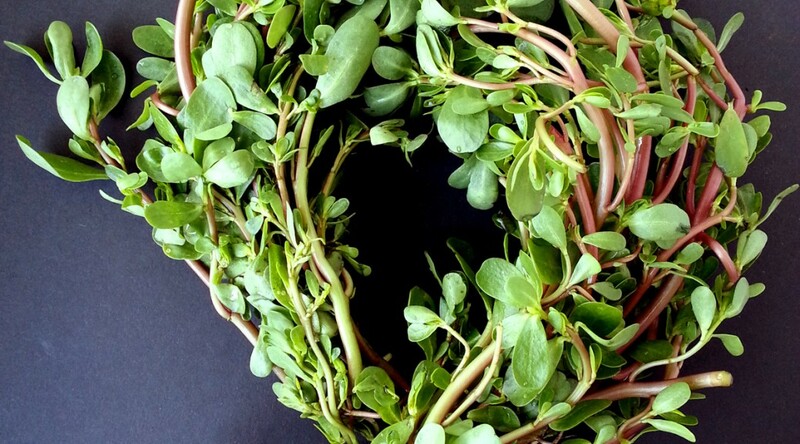 Preparing purslane is very easy: trim off the roots; soak the leaves and stems in several changes of cool water to get rid of grit; strip the leaves from the stems (tender stems can be kept, as they soften when cooked); wash again; and drain thoroughly before cooking. My husband planted the roots in soil to see if they will grow. After all, purslane is a weed, so hopefully it will thrive as most weeds do! With the remaining purslane, I am planning a filling for ravioli. Or maybe a chilled summer soup with a bit of yogurt, scallions, and dill. Either way, I’ll briefly boil the purslane to soften. I’ll keep you posted! 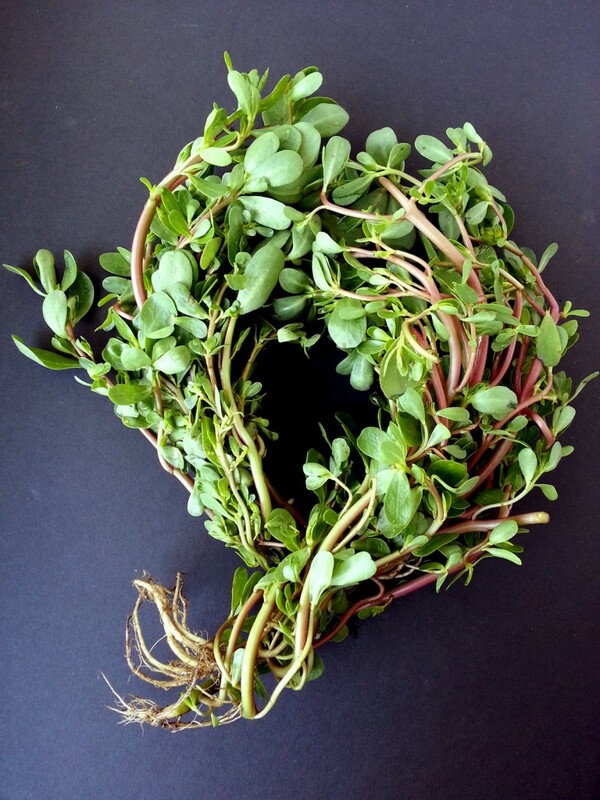 Wash the purslane thoroughly after getting rid of stems and roots, then dry it thoroughly. Place the olive oil and garlic in a 12-inch skillet set over medium heat. When the garlic begins to release its aroma, add the purslane. Cook 2 minutes, tossing with tongs or stirring with a spoon, until wilted. Season with the salt, adjust the seasoning if needed, and serve hot or at room temperature. Every summer, when it gets very hot, my husband and I salt-cure a salmon filet. It’s not only a quick thing to do; it yields enough fish to easily feed a dozen people and maybe even find yourself with leftovers the next day for topping crostini with Mascarpone and chives, or enriching a plate of homemade egg tagliatelle. 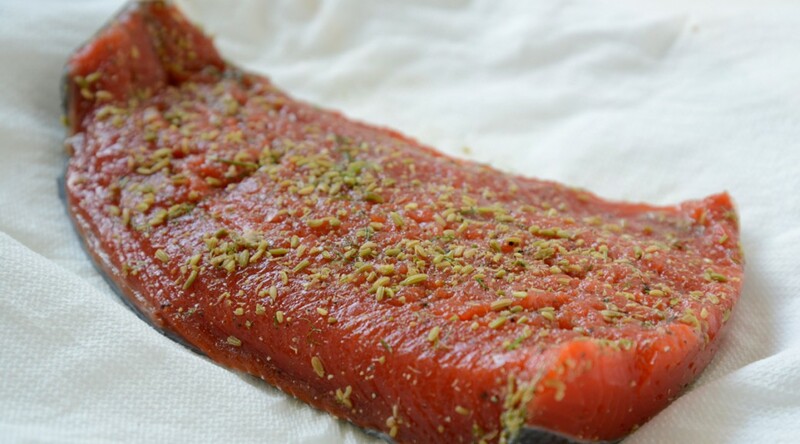 Basically a gravlax, this recipe requires only a pristine piece of salmon (I much prefer wild sockeye for its clean, intense flavor), sea salt, sugar, a few herbs and spices, and 48 hours of patience. 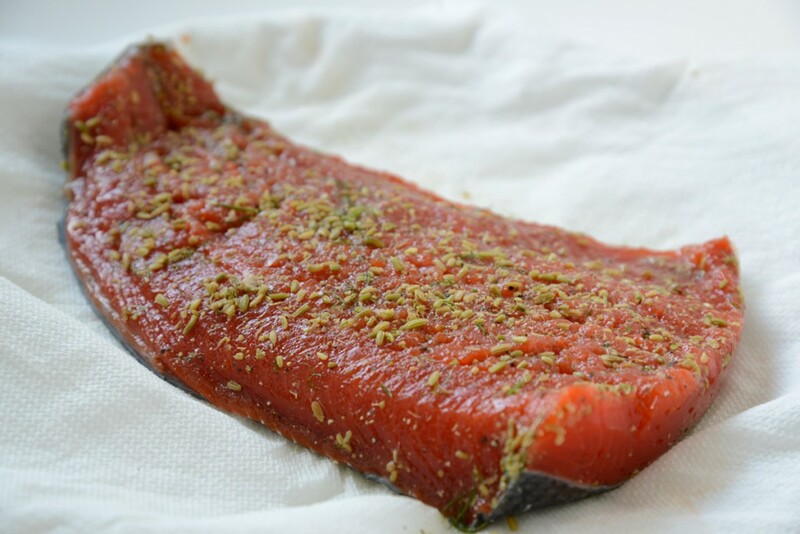 Most gravlax recipes have you enclose the salmon in plastic while curing in the refrigerator; I find the flavor brighter if the fish is simply allowed to sit in a covered container, where it can breathe. The most important thing when you are ready to serve the salmon is to use a very sharp knife to slice it as thinly as possible, and to serve it very, very cold. If you aren’t sure about the weight of the salmon, weigh it; the amount of salt prescribed is for a 2-pound filet. If the filet is smaller, it will end up too salty; if it is bigger, it may lack flavor. Adjust the quantity of salt and sugar according to the weight of the salmon filet. Make the salmon: Place the salmon in a deep storage container with a tight-fitting lid, or in a large roasting pan. Place the fennel seeds and black peppercorns in a mortar and crush with a pestle (or use a spice grinder) until medium-coarse in texture. The spices should not become pulverized, as a bit of coarseness adds to the visual and textural appeal of the final dish. Place in a small bowl and add the salt, sugar, dill, and lemon zest, and mix well. Spread the mixture all over the salmon, on both the skin and the flesh side, putting a little more on the flesh side. Arrange the salmon with the flesh side up. Cover the container with its lid or the roasting pan with a piece of aluminum foil, and refrigerate for 48 hours. When you are ready to serve, blot the salmon filet on several layers of paper towels (I blot the skin side as well as the flesh side, but I try to leave the spicing intact if possible). Using a very sharp knife, cut into nearly transparent slices, leaving the skin behind and working the knife at an angle so the slices come out wider. Place the slices on a platter while you prepare the salad. Make the salad: Toss the greens with the salt and pepper in a deep bowl. Add the lemon juice and toss again, then add the olive oil and toss one final time. Taste and adjust the seasoning. Pile onto 8 plates. 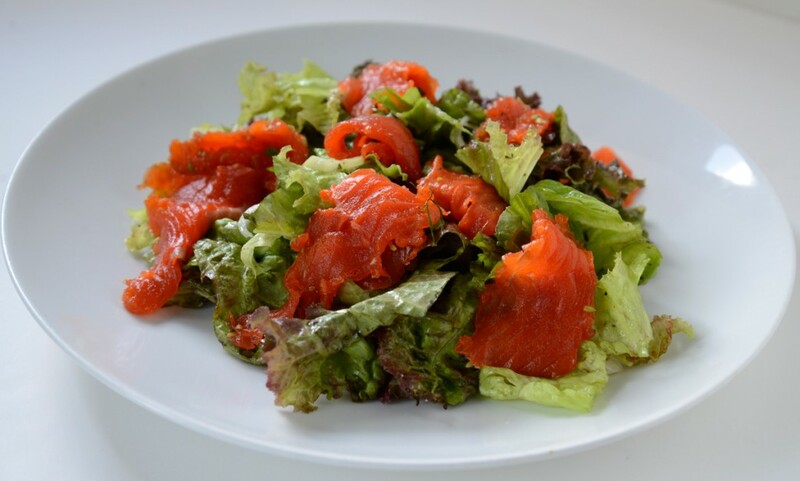 Top with the sliced salmon and enjoy immediately.